Requests for information on trustee candidates: We are receiving requests for information on the two trustee candidates running for the open trustee seat. Due to election rules the candidates must develop, copy, and make available any information as to their candidacy. The District has requested this information. Once both candidates have provided any information they wish to disseminate to the community this information can be made available if you wish to stop by the school. The District can post any information received by both candidates on the website as well. Chat with the Superintendents 4/10. 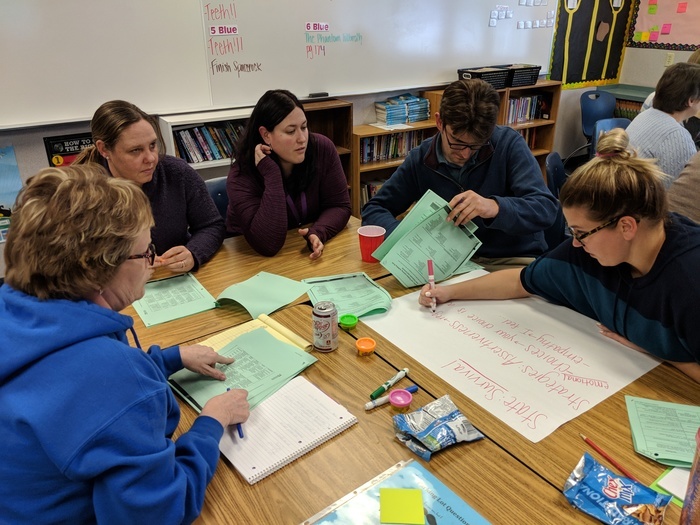 Do you have questions about our Blue Creek SD3 elementary mill levy? Perhaps you have questions about the SD2 High School mill levy as they are your high school district? If so, stop by the gym on Wednesday evening from 6:00-7:00 pm. Cathi Rude, Blue Creek Superintendent/Principal, as well as Greg Upham, Superintendent for Billings Public Schools SD2 , will be available to chat with you! Hope to see you there! First Grade Lunch Buddies 3/20 at 11:30 am. Early Out tomorrow, Wednesday 3/13 - we dismiss at noon - no lunch is served. Welcome NAIA Women's Basketball from Vanguard University! The Lions will be in to visit our school on Monday, March 11. Wear your blue & gold in honor of VU...Goooo Lions! School for March 4th is in session at regular time. We will follow our typical practice for cold weather and students will come directly into the building to begin the day. Any changes to the school day will be noticed via our website, email, alert system, radio, TV, & Twitter. 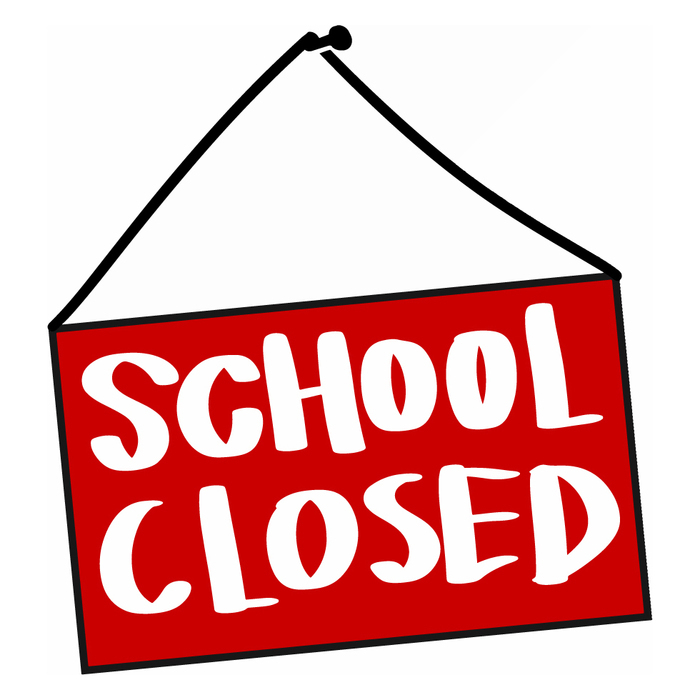 Due to weather conditions and considerations for the safety of our students, families, and staff, Blue Creek School will be closed Wednesday, February 27, 2019. School will resume on Thursday, February 28, 2019. Science Fair 2019. Info going home today. Entry forms can be accessed by going the the Menu, Documents, Science Fair. Questions contact Heather Mehelich at mehelich@bluecreekschoolorg. Early Out tomorrow, Wednesday 1/9/19 - we dismiss at noon - no lunch is served. Notice of Quorum of the Board Dec. 13, 2018 FOR THE FOLLOWING: Board Policy Review NOTICE IS HEREBY GIVEN, to the patrons of SD3 No action can be taken by the Blue Creek Board of Trustees during this review. MCA 2-3-203. Early Out is tomorrow, Wednesday 11/14 - we dismiss at noon - no lunch is served. Picture Day is tomorrow, Friday October 12th!! School Board Meeting Wed. Oct 10, 2018 @ 6:30 pm. Girls Basketball for 5th and 6th grade begins tomorrow! Regular School Board Meeting 8/14/2018 at 6:30 pm in the school gym. Regular School Board Meeting, 7/12/2018 at 6:30 pm. Quorum of the Board for discussion only 7/12/2018 at 6:00 pm. See notice in documents. 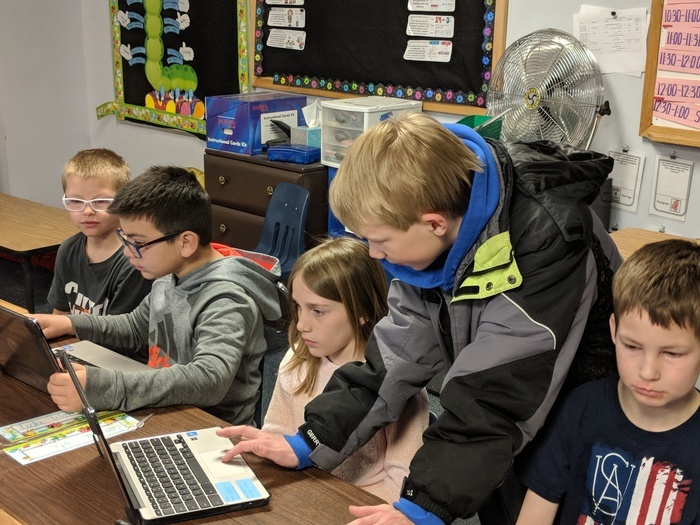 Older teaching younger on Chromebooks and Google Slides! How cool is this! Early Out Wed. May 2, 2018. Dismiss at 12:00 pm. Parent Teacher Conferences Great turn out last night for PTC's. They are tonight also from 4-8 pm. We are in need of a parent volunteer to help with class pictures tomorrow morning from 8:30 to 11:00. You will receive a free picture packet as a thank you! Please call 259-0653 if you are interested. Early Out March 7th, 2018. Dismiss at 12:00 pm. No lunch served! Family Read Night and Book Fair is tonight Monday, February 26th from 6:00 to 7:00! School is in session on 2/21/2018 at the regularly scheduled time. “Screenagers Growing Up In a Digital Age” 6:30pm-8:30pm FREE – No Ticket Needed Three screening dates and locations: 1/30/2018 Laurel High School Auditorium 1/31/2018 Lockwood Middle School Gymnasium 2/1/2018 Lincoln Center Auditorium Through poignant and unexpectedly funny stories, along with surprising insights from authors, psychologists and brain scientists, “Screenagers” reveals how tech time impacts kids’ development and offers solutions on how adults can empower youth to best navigate the digital world and find balance. Following the film, local parents and health care professionals will host a facilitated discussion to reflect on technology in life. Great training yesterday on our early out! 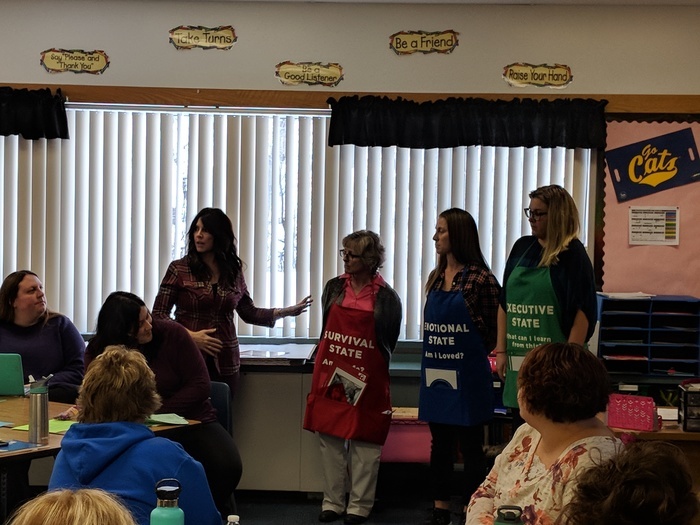 The staff learned a lot about Conscious Discipline with Jenny Barkac! Early Out Jan 10, 2018. Dismiss at 12:00 pm. 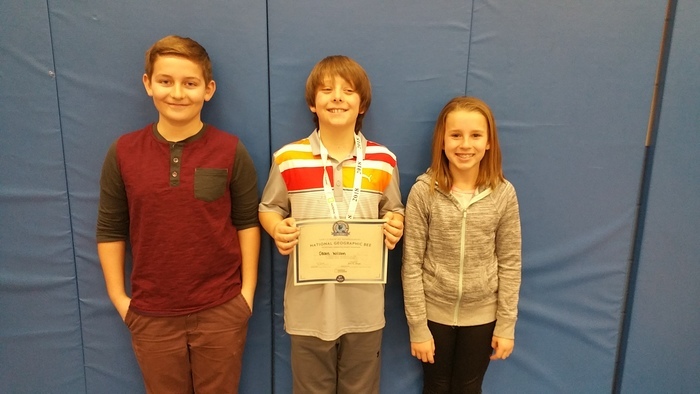 2017 Geo Bee Fianlists Congrats to David, Dason, and Sedley! School Board Meeting, Thur. Jan. 11, 2018 @ 6:30 pm at the school. Early Out Wed. Jan. 10. Dismiss 12:00 pm. 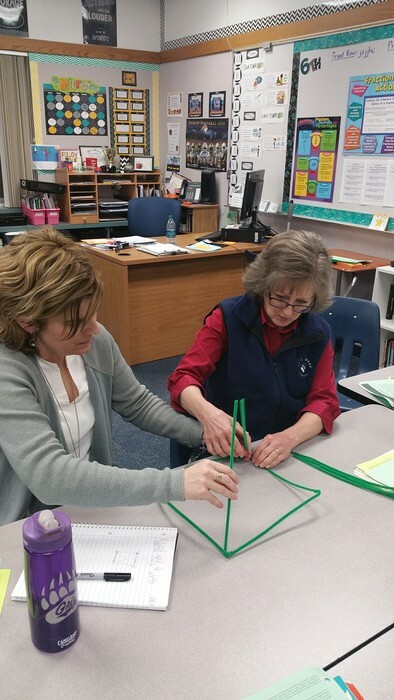 Check out what our Project Lead the Way teachers are doing! School Board meeting tonight Dec. 14, 2017 in the school gym @ 6:30 pm! A balanced breakfast encourages learning! Check out our new daily breakfast program. $1.60 for students, $2.25 for adults! Don't forget about our new Breakfast Program! From 7:50-8:10 every morning! See our website for details!